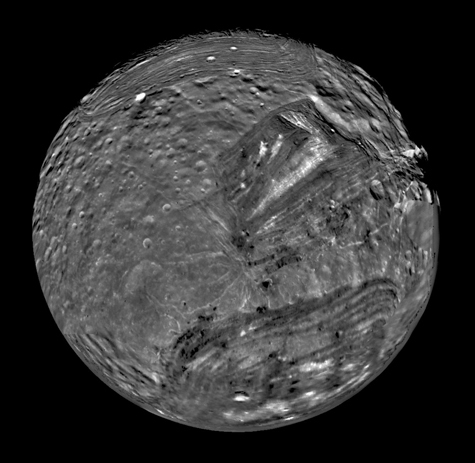 Voyager 2 visited the ice giants in the 1980s, the only craft ever to do so. Planetary scientists argue that new missions to each planet would also benefit heliophysics and exoplanet research. Launching a small orbiter with an accompanying atmospheric probe to the solar system’s ice giants—Uranus and Neptune—should be a top priority for NASA in the coming decade, say planetary scientists who conducted a review of potential missions to do so. Beyond being scientifically valuable, such a mission to each planet is technologically feasible, the team said. “It is important that the next mission to an ice giant study the entire system: the planet itself, the atmosphere, the rings, the satellites, and the magnetosphere,” Mark Hofstadter, a planetary scientist at NASA’s Jet Propulsion Laboratory in Pasadena, Calif., told Eos. Hofstadter is a coauthor of the June 2017 report that reviewed the mission potential for Uranus and Neptune. “Every component of an ice giant system challenges our understanding of planetary physics in a unique way,” he said. Here are five key questions the team wants to answer with dedicated missions to Uranus and Neptune. The team presented its findings and the state of ice giant science on Wednesday, 12 December, at AGU’s Fall Meeting 2018 in Washington, D. C.
1. 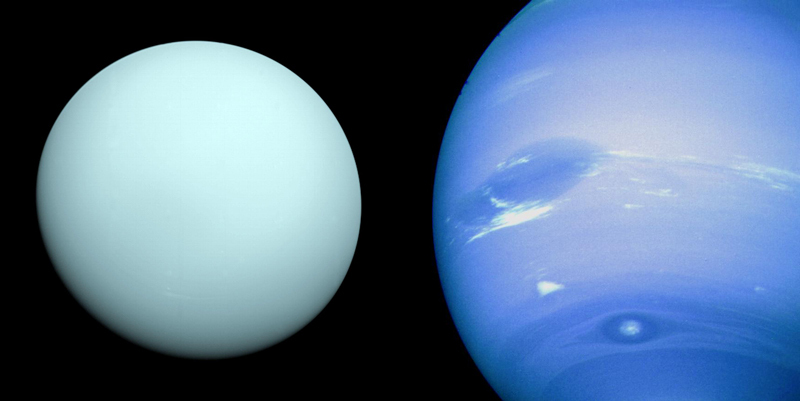 Why Is Neptune Too Hot and Uranus Too Cold? Uranus and Neptune, being about the same size, should release heat leftover from planet formation at similar rates. But that’s not what Voyager 2 found. “Jupiter, Saturn, and Neptune all emit more energy than they get from the Sun,” Hofstadter explained. 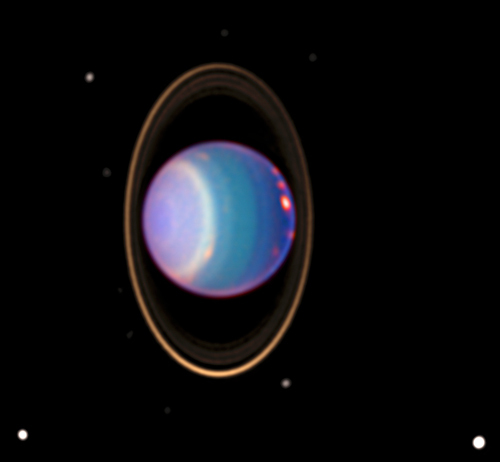 “Uranus stands out: It’s the only one that’s not releasing much internal heat.” It might be a result from the impact that tipped the planet onto its side, a result of differences in internal convection, or something else entirely, he speculated. 2. What Are Ice Giants Made Of? Unlike Jupiter or Saturn, the ice giants “appear to be enriched in heavy materials, that is, elements heavier than hydrogen and helium,” said Leigh Fletcher, a senior research fellow in planetary science at the University of Leicester in the United Kingdom who was not involved with the study. Past research has shown that the planets also contain significant amounts of ion-rich water. “How much is rocky and how much is icy is an open topic of debate. Why did they end up this way?” he asked. Pinning down the planets’ compositions would reveal where in the solar system they formed, Simon explained. It may also improve our understanding of planets of a similar size in other solar systems. 3. Why Are the Rings of Ice Giants Narrow or Clumpy? Uranus’s 13 rings are narrow and densely packed, a formation that needs “shepherding moons” to keep it gravitationally stable, Hofstadter explained. 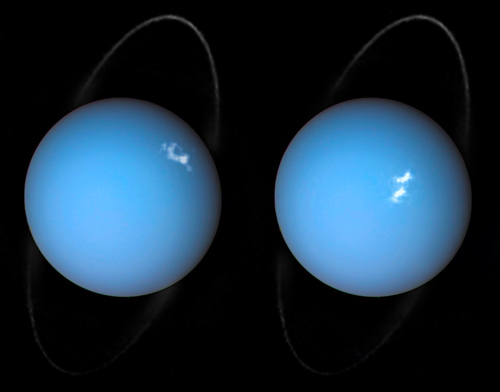 Uranus seems to be missing the moons to do that. Moreover, he said, the particles in Uranus’s μ ring look like those of Saturn’s E ring, which is generated by the plumes of Enceladus. The moon associated with the μ ring, called Mab, lacks plumes, he said, so this ring’s origin is yet unknown. “Certain portions of Neptune’s rings much denser than others and the details of how and why that happens are not clear,” he said. 4. What Is the History of Ice Giants’ Moons? “Neptune’s biggest moon, Triton, is basically a captured Pluto,” Hofstadter explained. Scientists think that Triton may have formed in the Kuiper Belt beyond Neptune’s orbit. Geysers and dark streaks on the moon’s surface suggest that it may have a subsurface ocean similar to Jupiter’s Europa or Saturn’s Enceladus. “We’d love to get a more careful look at Triton and see why it’s active, learn about what happens when you gravitationally capture a relatively large body, and compare it to Pluto,” Hofstadter said. 5. Why Are the Magnetic Fields of Ice Giants So Complex? Uranus’s and Neptune’s magnetic fields are relatively complex when seen from above when compared with those of the gas giants, Hofstadter explained. This complexity may suggest that the deep-interior process generating the fields actually happens closer to the surface than it does on Jupiter or Saturn, he said. Sending a probe to the planets could help paint a clearer picture, he added. “The brief Voyager flybys suggested these two planets had very irregular magnetic field,” said Fran Bagenal, a professor of astrophysical and planetary science at the Laboratory for Atmospheric and Space Physics at the University of Colorado Boulder. Bagenal, who was not involved with this study, said that a mission to these planets is critical to understanding how the planets generate magnetic dynamos in the water layers of their deep interiors and produce such irregular magnetic fields. Moreover, “how the solar wind couples to the ice giants’ magnetic fields is very different” from any other planet in the solar system, Hofstadter said, primarily because the fields themselves are so misshapen. For example, each planet’s field is severely tilted from its axis of rotation and is offset from the center of the planet. Also, “the planets’ magnetic fields change their orientations relative to the solar wind in a way that no other planet does,” he said. Studying these fields up close could prove to be good tests for our models of planetary magnetic fields and the solar wind, Hofstadter added, which would benefit heliophysics. Which planet should get a mission? For all that Uranus and Neptune are grouped together into the category “ice giants,” they are remarkably different worlds, Simon explained. An ice giant mission would need to be small enough to launch in a timely fashion but not so small that it can’t answer its key science questions, Simon said. “It’s a little bit of, do you put your eggs in multiple baskets not knowing if you get more than one basket,” she said. Citation: Cartier, K. M. S. (2018), Uranus and Neptune should be top priority, says report, Eos, 99, https://doi.org/10.1029/2018EO112187. Published on 14 December 2018.